People catch colds at all times of the year, but the virus tends to spread a little easier in cooler, drier weather. Also, in the colder months people tend to spend more time indoors, in close proximity to others, which also aids the spread of contagious germs. 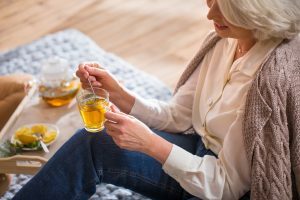 But regardless of the season, there are simple precautions you can take to avoid catching a cold as well as several natural remedies that may help shorten the duration of the cold virus. Get plenty of rest. Try for at least 8 hours a night. Eat foods that are high in vitamin C and other nutrients. Boost your immune system by incorporating plenty of fruits and vegetables into your diet, especially those packed with vitamin C like broccoli, spinach and citrus fruits. Wash your hands often and for a longer duration. The CDC recommends scrubbing hands with soap and washing them for at least 20 seconds for maximum germ fighting power. Keep hand sanitizing gel or wipes nearby. For the most effective results, opt for an alcohol-based hand sanitizer. Don’t skimp on exercise. Work out daily to keep your immune system in tip-top shape. Don’t share food or drink. Even if you’re sharing a drink with separate straws, you could be exposing yourself to germs. Don’t share your sneeze. Sneeze into the crook of your elbow to avoid spreading germs with your hands. If you do end up catching a cold, there are several natural remedies that may help relieve the drippy nose, congestion, cough and/or sore throat symptoms of the common cold. Gargle with warm salt water. This time-honored remedy can help relieve a sore throat and fight germs. Dissolve half a teaspoon of salt in one cup of warm water and gargle. Try this three times a day, and be sure to gargle the right way. Eat lots of chicken soup. Turns out that mom was right about chicken soup being the best thing for you. Studies show that chicken soup has anti-inflammatory properties that can help reduce mucus and shorten the duration of a virus. Use nasal irrigation or steam to reduce sinus drainage. A hot, steamy shower or bath can be a great decongestant. Also, using a sinus rinse kit with boiled and cooled water can help keep nasal passages free of germ-ridden mucus. Drink hot tea with honey and lemon. Warm fluids can help you stay hydrated and may be soothing for your throat. Lemon is high in vitamin C, and honey has antibacterial and anti-inflammatory properties. Apply warm packs to clogged sinus passages. This can be soothing and may assist in the draining of mucus from sinus passages which can help rid your body of infection more quickly. Treating overall wellness as a top priority is the key to fighting off the common cold. Contact Lighthouse Senior Living to learn more about our wellness programs that focus on physical and emotional health and wellbeing.